You have learned that if x is a non-zero number then x* x* x* = x3 and is read as the 'cube of x' or simply 'x cubed'. Therefore 27 = 3 * 3* 3 = 33 or 27 is '3 cubed’. These integers 1,8,27 . . . 8000 are called perfect cubes. How do we find out whether a given number is a perfect cube? If a prime p divides a number m then p3 will divide m3. In the prime factorization of a perfect cube, every prime occurs 3 times of a multiple of three times. Examine if (i) 392 and (ii) 106480 are perfect cubes. 7 is a double factor, it is not a part of a triplet so it is not a perfect cube. If you look at the table in the first page, you will notice that numbers with their units digits 1, 4, 5, 6 or 9 have perfect cubes whose units digits are also 1, 4, 5, 6, 9 respectively. A number with a units digit of 2 has a cube whose units digit is 8 and vice-versa. A number with a units digit of 3 has a cube whose units digit is 7 and vice-versa. The cube of a negative number is negative. (-2)3 = -2 -2 -2 = -8 = - (2)3 etc. So, negative numbers can be cubes. We can find the cube of a number by multiplying the number with itself three times. Another method which is based on the algebraic identity can also be used. Recall that to find the square of a two digit number you used (a + b)2 = a2 + 2ab + b2 and you formed three columns and worked out the square. Here we will use the algebraic identity (a + b)3 = a3 + 3a2b +3ab2 +b3 and form 4 columns and we will find the cube by a similar method as that of the squares. Find the cube of 89, using the alternate method. We take a = 8 b = 9. Make 4 columns. In the first column write a3, second 3a2b, third 3ab2, and in the fourth write b3. Write the values of each. Underline all the digits. The required cube is 704969. We combine all the underlined digits to get the value of the number required. Examine if 53240 is a perfect cube. If not, find the smallest number by which it must be multiplied to form a perfect cube. Also find the smallest number by which it must be divided to form a perfect cube. 5 is not a part of a triplet. For 53240 to become a perfect cube we need to multiply it by 5 * 5 = 25. The smallest number by which 53240 must be multiplied to form a perfect cube is 25. If we divide 53240 by 5 then the resulting number will be a perfect cube. So 5 is the least number by which 53240 must be divided to obtain a perfect cube. You have already seen that in the prime factorization of a perfect cube, primes occur as triplets. We therefore can find using the following algorithm. Step 1 Find the prime factorization of n.
Step 2 Group the factors in triplets such that all three factors in triplet are the same. Step 3 If some prime factors are left ungrouped, the number n is not a perfect cube and the process stops. Step 4 If no factor is left ungrouped, choose one factor from each group and take their product. The product is the cube root of n.
Find the prime factors of 551368 Group the factors in triplets each factor of the triplet being the same. Select a factor from each triplet multiply these factors. Write your answer. Perfect cubes which are six digit numbers can be obtained using the method of the units digits. If a six digit perfect cube has a units digit of 0, 1, 4, 5, 6 or 9 then its cube root will have a units digit of 0, 1, 4, 5, 6 or 9. If however the units digit of the cube is 8 then the units digit of the cube root will be 2. If the units digit of the cube is 2 then the units digit of the cube root will be 8. If the units digit of the cube is 7, the units digit of the cube root will be 3 and if the units digit of the cube is 3 the units digit of the cube root will be 7. The cube root of a six digit perfect cube will have at the most, two digits, because the least seven digit number 1000000 = 1003 and its cube root 100 is a three digit number. Step 1 Look at the digit in the units place of the perfect cube and determine the digit in the units place of the cube root as discussed above. Step 2 Strike out from the right, the last three digits, that is, the units the tens and the hundreds digits. If nothing is left we stop. The digit in step 1 is the cube root. Step 3 Consider the digits left over from Step 2. Find the largest single digit number whose cube is less than or equal to those left over digits. This is the tens digit. The digit in the units place is 2. Therefore the digit in the units place of its cube root is 8. Strike out the 3 digits – the units, the tens and the hundreds. The required cube root is 8. Units digit of 2197 is 7 so the units digit of its cube root is 3. Strike out the units, tens and hundreds digitsDigit left is 2. Find the largest single digit number whose cube is less than or equal to this left over digit 2 In this case it is 1. Units digit of 117649 is 9. So the units digit of its cube root is 3. Strike out the units, tens and hundreds digits number left. The largest single digit number whose cube 64 is less than 117 is 4. Find the smallest number by which the following numbers must be multiplied to obtain a perfect cube. Also find the cube root of the resulting number. Find the smallest number by which the following numbers must be divided so that the products are perfect cubes. Also find the cube root of the resulting number. Fill in the blanks by observing the pattern. Find the cube roots of the following numbers by finding their units and tens digits. In order to obtain a perfect cube we need 7 to complete the triplet and 13 * 13 to complete the next unfinished triplet. 7 * 13 * 13 = 1183. The extra factor 3 is not a part of a triplet. So we need 3 * 3, to get a perfect cube. The least number by which 107811 must be multiplied is 3 * 3 = 9 so that we get a perfect cube. We need a 7 to complete the triplet. 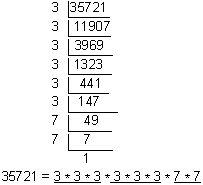 The least number by which 35721 must be multiplied to form a perfect triplet is 7. 17 *17 is the least factor needed to divide the number 7803 to get a perfect cube. 289 is the least by which 7803 must be divided to obtain a perfect square. 2 is the least factor which is not a part of a triplet. 2 is the least number by which 8192 must be divided so that it forms a perfect cube. 2 * 2 * 3 * 3 = 36 is the least number by which 26244 must be divided to obtain a perfect cube. Tens digit of the cube root is 7. Units digit of the cube root is 3. Strike out the units, tens, and hundreds digits. The largest single digit number whose cube 343 is less than 389 is 7. Tens digit of the cube root is 4. Units digit of 91125 is 5. Units digit of the cube root is 5. The largest single digit number whose cube 64 is less than 91 is 4. Units digit of 46656 is 6. Units digit of the cube root is 6. Strike out the units, tens, and hundreds digit. The largest single digit number whose cube 27 is less than 46 is 3. The cube root's units digit is 8. Strike off the units, tens, and hundreds digits. The single largest digit whose cube 64 is less than 110 is 4.